Friends, I’d like to introduce another female rider this week, Jennifer and her 2012 Harley Davidson Sportster SuperLow. 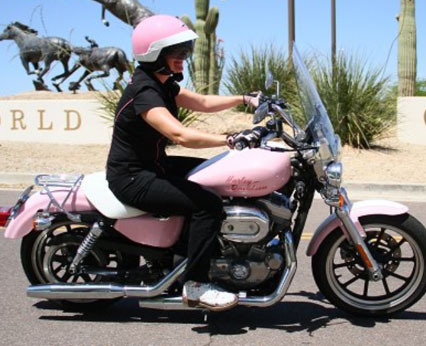 This is no ordinary SuperLow though, she has had it custom painted to one of her favorite colors, pink. It is a light pink, very gentle and relaxing on the eyes with a white stripe down the middle. Also, the girl has a matching pink helmet, and diamond encrusted gas tank cap. Jennifer is here to show you that real women ride, and we look better doing it than men! She has been riding for only about a year, but whenever she is on her bike, she feels “it’s like meditation”. When asked what got her into the wonderful world of Harley Davidsons, she decided that she wanted more than just to be a passenger on her husband’s bike and was “tired of not being able to see passed his giant noggin!” Jenn even has a name for her custom two- wheeled slice of paradise, Joi, because it brings her joy with every passing curve on the road. While riding alongside her, I have noticed a lot of passengers, and some drivers (scary) leaning out their windows to take pictures of Jenn and Joi. The two are truly one of a kind and people love talking to her and giving the bike compliments. Cruising out to Julian, in the back country of San Diego, is her favorite place to ride. 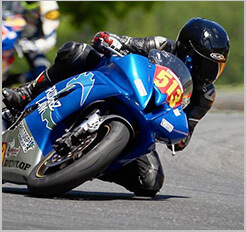 Julian is a great route for any biker, it is a long, twisting and winding road with exciting countryside views, and places to stop for gas and grub. It was on one of these rides that a bee got wedged inside her helmet. As it crawled around on her face, she realized that there was no shoulder on this mountainous road. She panicked for a second, then knew she had to keep her cool and pull over. In the end, she found a spot, and carefully removed the helmet and was not stung. Jennifer’s dad does not like the fact that his daughter rides, as with most family members. However, her sister has a slightly different reaction. She will worry like any other sister would, but Jenn thinks that she lives vicariously through her. There will always be people who wonder what it is like to be on a powerful piece of metal going 80 MPH with the fresh air blowing in their face, the freedom, the peacefulness. But, until they throw a leg over, crank the engine to life, shift into gear, they will never know what they are missing. In Jennifer’s own words regarding Harleys, “If you don’t have one, you should get one, it’s amazing”.